SEOUL, SOUTH KOREA, March 14, 2019 /EINPresswire.com/ -- In recent years, increasing number of Korean men, from young-aged to middle-aged, are practicing ‘self-care’ for their appearance. 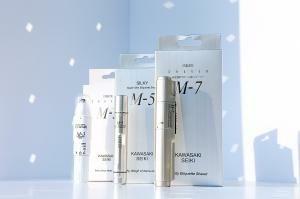 The male K-beauty market, which was traditionally limited only to the young population, is gradually expanding to the older generation as well. Male beauty devices tailored to these trends are being newly introduced to the market, and they are gaining popularity. In the midst of this trend, Kawasaki's Nose Hair Remover1 has gained vast attention, being well-received and covered by celebrities as well as well-known YouTubers on social media. Equipped with both practicality and design, the product has now gained a reputation as a must-have item for many celebrities in Korea. Kawasaki Nose Hair Remover helps men to easily manage their nose hair at home, and it is one of the main products by Kawasaki, which is a leading beauty consumer electronics brand with over 60 years of innovative technology and know-hows in the industry. Featuring a patented dome configuration, Kawasaki’s nose hair remover has an ergonomic design that reduces any foreign body sensation and safely removes the nose hair without creating tangles or blemishes. In addition, the dome-shaped outer blade is coated antimicrobially to prevent external contamination and can be cleaned with running water, making it sanitary to use for a long period of time. The product’s compact size that allows one-handed usage and its sophisticated design are highly appreciated by consumers of all ages. Taerim Household & Health Care, the official sales representative for Korea market, quoted saying "We are very pleased to be appreciated and recognized by our consumers. In return, we will focus our efforts to build a touching brand with more satisfying quality and service by paving the way for continuous improvement on our consumers’ safety and convenience. TAERIM Household & Health Care Co., Ltd.